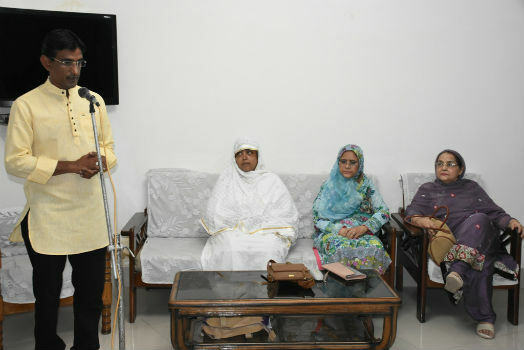 Aligarh: The Ladies’ Club of the Aligarh Muslim University and its charitable venture, Ismat Literacy and Handicraft Centre organized a felicitation programme for Mr. Azhar Maqsusi from Hyderabad at the monthly meeting of the Club, held at the New Guest House. Dr. Hamida Ahmad presided over the felicitation programme. Addressing on the occasion, Mr. Maqsusi shared his valuable experience in holding charitable programmes and launching support campaigns for the marginalized section in different parts of the country. He also appreciated the initiatives taken by the AMU Ladies’ Club and the Ismat Literacy and Handicraft Centre for the empowerment of weaker section, especially women. In her presidential address, Dr. Hamida Tariq praised the efforts made by the Ladies’ Club to empower women by providing them vocational training. Earlier, welcoming and introducing the guest, the Secretary of the Ladies’ Club, Ms. Sabiha Naaz Lari said that Mr. Maqsusi is widely known for his charity works including the campaign “Do Roti”, which is running in different cities of India for over the last six years. Ms. Lari said that Maqsusi has been instrumental in opening free clinics, mobile food van, free vocational sewing centres, helpline counters and mobile hardware workshops. Based on the saying that “Hunger has no Religion”, Maqsusi’s efforts have earned him wide acclaim from different quarters including felicitation by Ramkrisha Mission and Mother Teresa Janseva Award. He has also been hosted by Amitabh Bachchan at his programme “AajKi Raat Hai Zindigi”.